Now what’s so special about me doing my laundry on May 21st? Well, it’s supposed to be the day of “Rapture”….well, at least to a Rev. 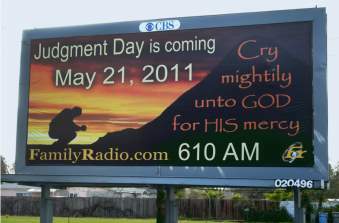 Harold Camping who claims to have studied scripture for well over fifty years and has pinpointed the day of Christ’s return. The day of rapture for the followers of Christ will be May 21st and those left behind (unbelievers) will face a massive world-wide earthquake that will eventually lead to the earth’s ultimate destruction on Oct. 22. Camping has so convinced his followers of this date that many have sold all their possessions and they are spending their remaining days telling everyone they know to prepare themselves for God’s judgement. Repent and be saved they say before it’s too late. Should we be preparing ourselves for Christ’s return? Absolutely. As Christians we are called by God to share the Good News of Jesus Christ with everyone so that “none should perish”. (2 Peter 3:9) I will admit I am not an evangelist. I don’t pound on doors or raise billboards to get the Message out. I write. I have lunch with friends and I live so that others (hopefully) will see the Light of Christ living in me. My hope is when people ask me, I have an answer that sparks conversation and I am able to share my love for the Father with real people, who see a real person (me) living in the real world, facing real heartache and real pain at times, but plugging on because I have a Saviour. How should we live? “…since you are looking forward to this, make every effort to be found spotless, blameless and at peace with Him.” (2 Peter 3:14) I live expecting God to return on any given day at any given time. I don’t want to be surprised by His arrival, I want to be ready for His arrival. It means keep on keeping on. If by some obscure chance, Camping has somehow cracked the code of Christ’s return and the day of Judgement is indeed May 21st, let me be found faithful on that day as in all the days leading up to that day and all the days after. And if that day comes and goes without God’s glorious reappearing (as I suspect it probably will), I plan on doing my laundry on May 21st because my family will still need clean clothes for May 22nd. Just sayin’……….. This entry was posted in Inspiration & Devotion, Proverbs 16:9 - Journey Thoughts and tagged 2 Peter 3 10-14, 2 Peter 3:9, 2011, Christianity, end times, Harold Camping, Judgment Day, Matthew 24:36, May 21, Rapture, Scripture. Bookmark the permalink. Each day could be our last and so we should be prepared, living in Christ’s love by keeping His commandments. I remember a friend giving up a well-paid job in the city and rushing off to the wilderness of Wisconsin to await the crash of the whole computer system. It didn’t happen. The school children of acquantances of mine said “well, we know for sure that Jesus is not coming back that day” but he might be here today! Great commentary Lynn. First time I have read your blog and its very insightful. I agree that the Scriptures agree that we don;t know the day, but we need to be ready. Jesus is coming back. Lynn praying for a good launch on the 21st, luv your books! Lynn, as usual you get to the point of it all with clarity in God’s word for us. On May 21, I will be in touch with my elderly Mom, probably keeping her at my home with my husband and I. We will need to keep her spirits up as my older sister is a follower of Camping—need I say more? My Mom does not read enough Scripture to understand how false Camping’s teachings are, but my husband and I know. And we are left to bolster the spirits of a woman who has been confused by the actions and words of a beloved daughter. We have tried to explain to my Mom that Camping is false, but she has difficulty understanding many of the particulars because she is so elderly. Knowing my own family’s difficulty, there have to be millions of us facing a similar crisis at this time. I keep praying for my sister, but she is determined to believe this lie. And I am having difficulty not being angry with my sibling because of all the hurt she has dealt our whole family. Please pray for us. Thanks for a great post, Lynn. thank you for this – what wonderful, good thoughts,- joyful insight! I too will keep on keepin on……. !! and have meant to let you know – I love, loved your second book, “Heal the Wounded” – could not put it down and what a beautiful reminder for me to pray and let God handle the day….. Amen and Bless YOU!! You left us on such a cliff hanger……… can’t wait for the next book!! Holy moly, girl! I didn’t know you had a baby grand here! I would love to see you when you come in October! Too cool! And amen! Keep on planting trees, keep on with business, keep on doing, keep on with loving…just keep on! Great post!